Mr. Yamamuro answered our questions with a smile. He is wearing bracelets on his right arm, which he was given in a ceremony in Laos. Hello! My name is Fujii, a PR intern in 2018 for JVC. It has been 3 years since the Staff Interviews began in 2015 and we have more staff now. So then, this year we decided to resume the interviews with new members. Contents will include their reasons for working at an NGO, the unexpected sides of the staff, and so on. We will try to post updates frequently. Please check it out and enjoy our pages! 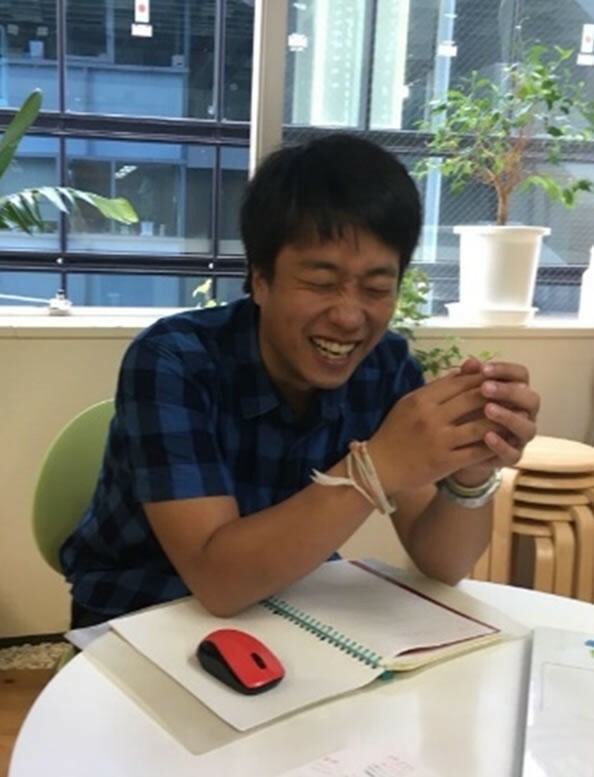 Well… The very first person of 2018 is Ryohei Yamamuro, the program coordinator of the Laos project, who is also working in Laos. He joined an NGO without having any experience of a full-time job, which is a very rare case. At first glance, he seems to be someone who is devoted to international cooperation, so people might have images of him as a very serious person. However, he actually is a mischievous person. He started at JVC in 2016 and now it’s been 3 years since he was stationed in Laos. We asked him a lot of questions when he temporarily returned to Japan. Why did you decide to work in the field of international cooperation? I think it is because I started wondering about how money plays a role in the world economic system. I had been gradually having some thoughts to support the people who always need to adjust to economic changes without having proper knowledge about the situation. After all, people such as farmers and/or people who don’t have strong economic power have to find a way to deal with problems such as increasing expenses or stock price changes. Also, I’ve seen so many money problems and discrimination when I was younger. I never liked the way of making money. What did you study when you were in college? I majored in media sociology in my university. To be honest, I never thought about studying international cooperation. Back in my elementary and middle school, I really liked comedy, especially black jokes and that type of stuff. I was hoping if I could make people laugh their troubles away, they would forget about the contradictions and absurdities in this world. After I entered college, I had Hockey practice 5 days a week and I ended up being a student athlete. So then, what started your interest in international cooperation? 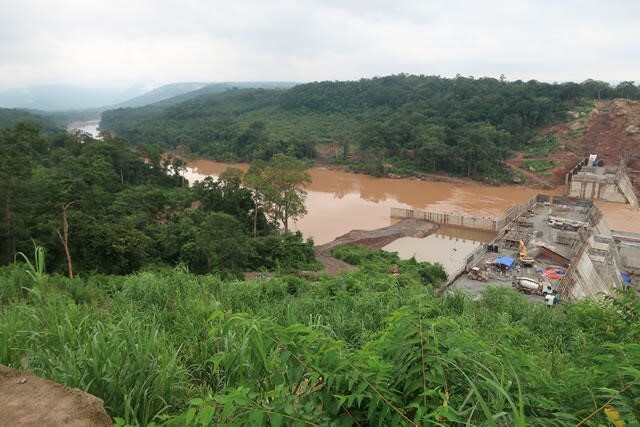 The construction of a dam in Laos. I guess it’s because of the experiences from a seminar in my college. The teacher from the seminar studied with a mindset for socially disadvantaged people, which I used to feel when I was younger and that made me want to be involved. For my graduation thesis, I studied based on a theme of Anti-modern rationalism and researched about the things related to my past awareness, for example, by reading the book The Human Condition by Hannah Arendt. Being able to learn in the seminar about “being there for socially disadvantaged people” is a huge support for my work even now. Moreover, since international cooperation needs physical strength, the experiences from my sports team help me a lot as well. We heard that you went on a backpacking trip to India when you were in college. Please tell us about your experiences at that time. I’ve been to India twice. The first time, I was there for 3 weeks and the second time was only 2 weeks but both times, I traveled by myself. Since I read the book Fukaikawa (Deep River) by Shusaku Endo, I became interested in the flow of time in India and their beliefs. It made me go there to see it with my own eyes. Another reason that I went was that I had an image of Indian people living a different life, which is not focused on working style and a money-focused life. Do you want to visit India again? Please tell us the reasons why you joined JVC. A meeting with villagers. Since it’s difficult to convey activities data, this kind of occasion is important where we can talk to each other in person. While I studied in graduate school about immigrants and natives who are disadvantaged under the policy of economic rationalists, I started thinking things like “I want to go there and be involved in supporting rural development”. Right after I dropped out of graduate school, I started seeking an NGO for international cooperation that had a local staff position opening. People around me didn’t recommend me to enter an NGO as a recent graduate but I didn’t have any opposition to trying it. While I kept checking NGOs, I was attracted to JVC which does activities focused not only on supporting farms but also on social issues. I decided to join it. Around that time, I didn’t have any preferences about countries and I just wanted to work for rural development. If there was a local staff position open in other countries, perhaps I might have applied for that. Thinking like that, working in Laos as local staff must be fate. 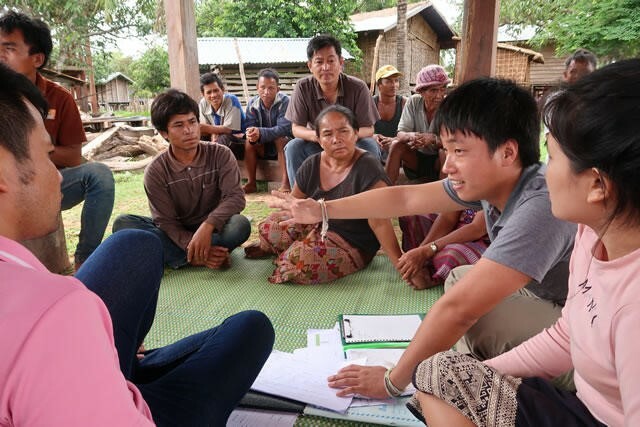 You work in Laos by speaking the local language however, was it hard to acquire Lao? It wasn’t that hard (ha-ha). I had enough time to focus on my studies in my first year of residency so I could study more than I expected. I practiced by repetition for vocabulary and grammar by using textbooks I bought in Japan. I listened to listening materials over and over again. Due to this fact, I don’t have any tips for language acquisition. Just taking your time practicing repeatedly. 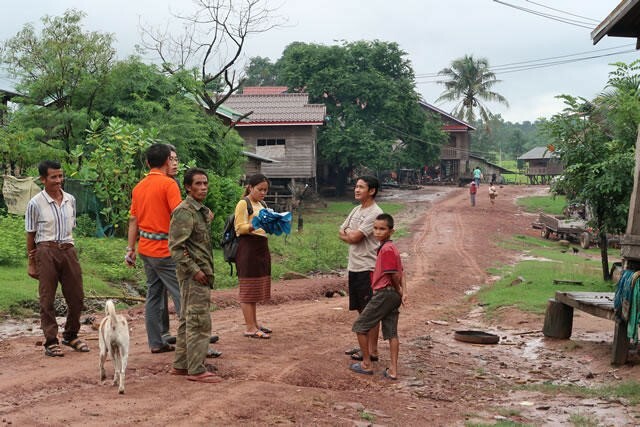 Since there were a lot of chances to verbally communicate with the local people and administrative officials, I was required to know Lao and I was responsible for that so it wasn’t too tough. Frankly, what are the attractive points of Laos? 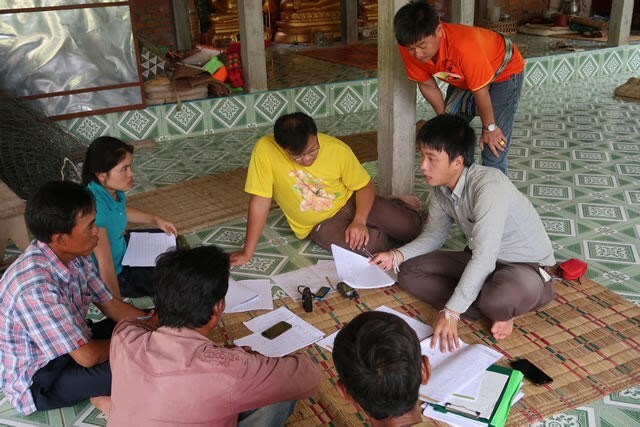 We discuss with local staff and make decision together. In this Country, people always live with nature; it’s a simple place that’s full of laughter. I have so many chances to feel in touch with a life close to the earth. The local people live together with nature and agriculture. I admire that kind of life. Also, Laotian people talk and laugh about anything, even small things. My office is always full of laughter. Furthermore, another great thing about Laos is that beers are cheap and good. Drinking beer after work is the best after all. A scene of a village of Laos. In any aspect such as values, origins, and positions, we are all different people yet we have to live together with limited resources. Therefore, I hope there will be no oppressed people and at least we all could live with less anxiety. Please leave us with a message for your juniors who have their eyes on international cooperation. Do not keep playing around all day long. Study harder, read books, go to a lot of places, and try as many things possible there. Do something where you can contribute to the world. At least, never bring a bad influence into the world. This might be pretty much everything you can do for now. This is enough to be thought of as “a great job”. 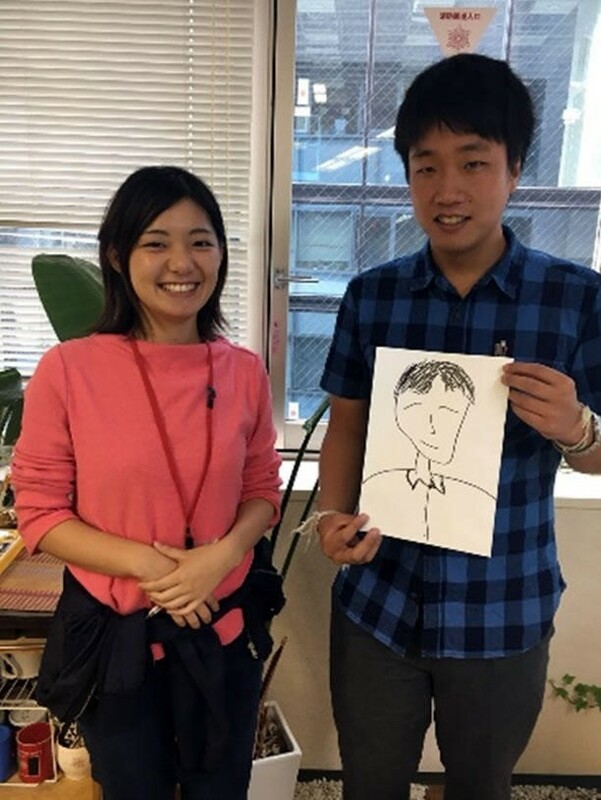 Next time, we are going to interview the person who Mr. Yamamuro mentioned as a “friendly Kansai person (A person from the western part of Japan)”. Please look forward to it! Thank you for visiting our page. The gentle eyes may give you a hint but where are his ears? 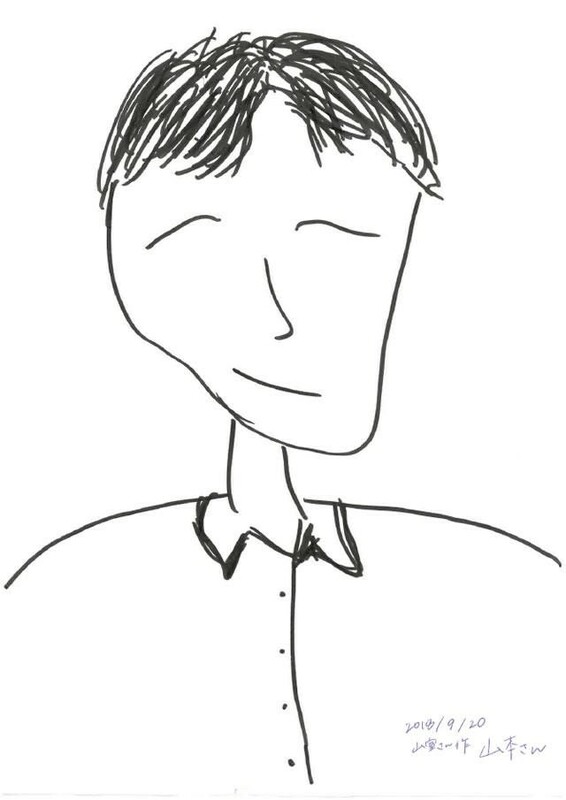 He quickly drew a simple picture of the next interviewee with a pencil.